Liver is an extremely important organ with high regenerative capacity and complex functions. It acts as a complex metabolic bioreactor of the body, performs a myriad of functions like gluconeogenesis, plasma protein synthesis, urea synthesis, drug detoxification, and waste removal, immune and hormonal modulation etc. During the course of acute and chronic liver damage the regenerative capacity is either impaired or lost leading to liver failure. Till now liver transplantation is the only life-saving procedure for these patients. Many of its associated disadvantages, such as the relative shortage of donors, operative risks, Graft-Versus-Host Reaction (GVHR) associated death and a high cost limits its potential benefits. Restoring the normal regenerative capacity of the liver holds great promises in the management of liver disease patients. 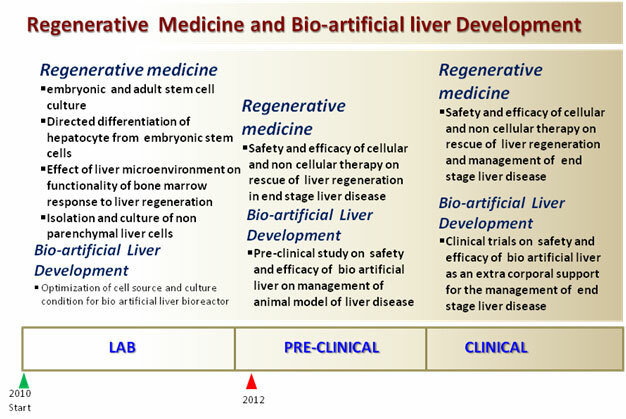 Currently we are working on the following areas to devolve a regenerative medicine based therapy for end stage liver diseases (Fig.1). 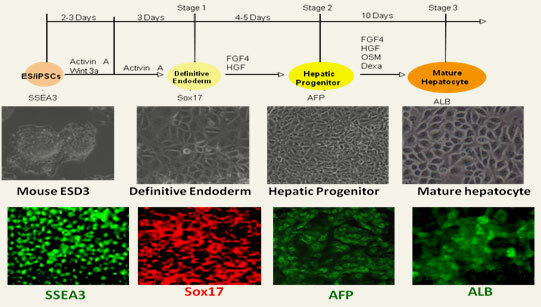 Fig 3: Photomicrograph showing different stages of in vitro differentiation of embryonic stem cells into hepatocytes. (Top) differentiation protocol time scale; (middle) light microscopy image of cells at various stage of hepatic differentiation; (lower) Immunofluorescence image of cells at various stage of hepatic differentiation showing the presence of stage specific markers. Fig 4. Steps of rat liver decellularization and seeding of hepatocytes on liver matrix coated with Poly NIPAm chitosan scaffold. The table shows the increase in liver function parameter in presence and absence of liver matrix. The bone marrow-derived circulating endothelial progenitor cells (EPCs) has been shown to be associated with post-natal vasculogenesis/angiogenesis. However, the role of EPCs in intrahepatic angiogenesis in cirrhosis was unclear. In a landmark study from our group, we showed for the first time an increased levels of circulating endothelial progenitor cells (EPC) in cirrhosis patients compared to the controls (P < 0.05) which also correlated with severity of hepatic disease (Fig. 1). Further, functional assays revealed that colony number and proliferation of EPCs were significantly increased in cirrhotic patients than the controls (P< 0.05). 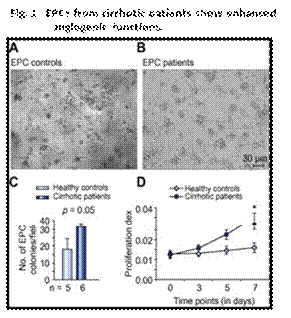 Direct and indirect co-cultures of patient EPCs showed an increase in tube-formation by sinusoidal epithelial cells (SECs) as compared to that observed with control EPCs (P< 0.05). ELISA studies indicated a substantial rise in the levels of PDGF and VEGF in patient’s EPC media as compared to controls EPC media (P< 0.0001). Finally we conclude that EPCs seem to play an important paracrine role in liver angiogenesis by stimulating resident SECs. Our study which highlights a new mechanism for intrahepatic angiogenesis has generated much enthusiasm in the liver-community and has received a rave editorial comment and cover page highlight in the December 2012 issue of the Journal of Hepatology.